Goals from Donny van de Beek and teenage captain Matthijs de Ligt saw Ajax stun Serie A champions Juventus with a 2-1 win to reach the Champions League semi-finals for the first time in 22 years after an unforgettable night of football in Turin. Erik ten Hag's men have broken records aplenty and won new admirers after another impressive all-round display, which marks the first time in nine successive years that Cristiano Ronaldo will miss out on the competition's semi-final stage altogether, whilst also being the first time Ajax have beaten Juve since 1974. It was Ronaldo himself who broke the deadlock with a close-range header just before the half-hour mark. However, the bullish visitors responded in style to equalise six minutes later, after Hakim Ziyech's goalbound effort fell perfectly for van de Beek - slotting into the bottom corner beyond Wojciech Szczesny. Juventus had Szczesny to thank for keeping the scores level, as the former Arsenal man was forced into making a string of important saves to keep Ajax's fearsome attack at bay in a match where they carved open opportunities but failed to capitalise on most of them, predominantly by overplaying or picking the wrong option at the final moment. But their pressure told and it was none other than 19-year-old de Ligt who provided the hammer blow, leaping above two defenders to head home midway through the second-half. For all their quality, experience and nous in high-pressure situations, Juventus wilted under the pressure and ultimately failed to recover. Considering the frenetic nature of their 1-1 draw last Wednesday, neutrals would have been hoping for more of the same on this occasion. After a tense opening here, there was only ever really one man poised to spark the game into life - Cristiano Ronaldo. So naturally on his 699th club appearance, the Portuguese duly delivered. It was by no means the best goal he has netted this season, nor did it mirror any from the previous round during their impressive comeback over Atletico Madrid, but the 34-year-old broke the deadlock from close-range and made the visitors pay for their lax marking to devastating effect. A defensive communication mix-up between de Ligt and Joel Veltman saw him left unmarked and from Miralem Pjanic's corner, he had both time and space to dart towards the six-yard box and head goalwards, picking his spot beyond a helpless Andre Onana as the ball flew into the bottom corner. 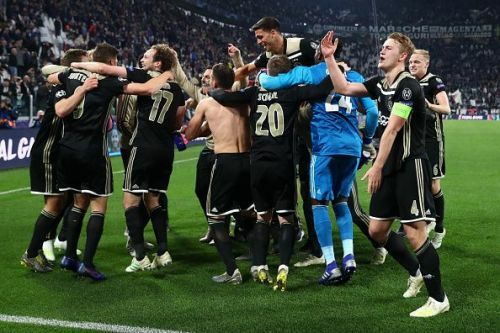 It should have been the start of a memorable evening for Juve, but instead proved the catalyst for Ajax's stunning response. 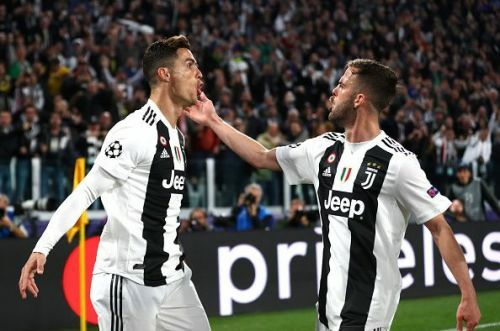 Ronaldo, the man they happily spent £100m on last summer to win this competition, found himself marked tighter and frustrated more regularly as the match wore on after van de Beek's swift equaliser. Dispossessed twice, fouled on four occasions and regularly misplacing passes, Ajax's backline did well to ruffle his feathers after conceding such a preventable finish. Rather than to continue playing with the fearsome attitude we know he can, Ronaldo was often arguing with officials and occupying areas in the final third that were easier to defend against in numbers. It's why de Ligt in particular sort to thwart him whenever possible, particularly as his movement was limited to the far/near post and preying on the last defender's off-the-ball position. As a result, he'll miss a great chance to retain the Champions League, a competition that he's made his own in recent seasons and previously won three consecutive years with Real.